The recovery mode is a state in the iOS that helps you get out of stuck issues. People all over the world use recovery mode in order to solve stuck issues. But what if you face iPhone recovery mode loop? The iPhone recovery mode loop is a state where the user gets stuck in recovery mode and is unable to get out of it no matter what. People all over the world face this issue. And believe us; it is very frustrating to get out of the recovery mode once stuck. If you are one of the users that got stuck in endless recovery mode, this is the right place to land. Today we will show you how to get rid of this situation. But before that, let us have a close look of what happens when iPhone stuck in recovery mode loop. As mentioned above, while facing this issue, you get stuck in the recovery mode and are not able to get out. But is the actual reason for you to get stuck in the recovery mode? When users face this issue, there might be a number of reasons. It might be due to a failure in the process of entering and exiting the recovery mode. Or it might be the lack of knowing where you are not aware of the process and try to perform it in an incorrect way. In addition to this, sometimes, the issue can be faced due to lack of memory as well. 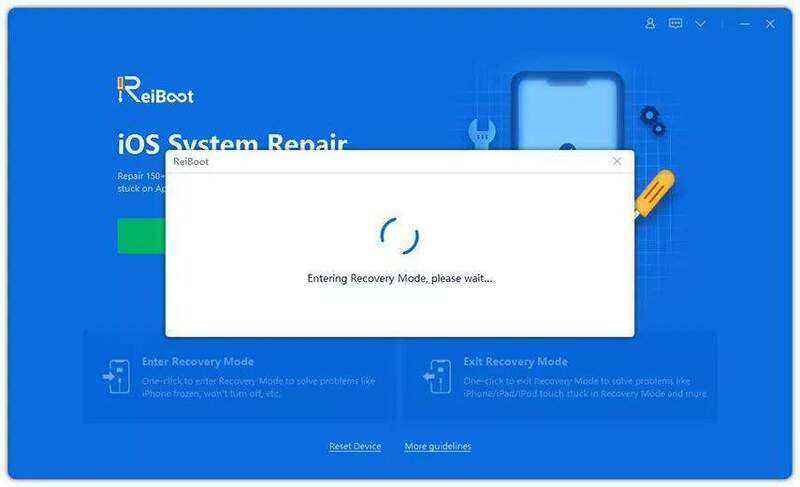 The ultimate solution to exit recovery mode loop is none other than free recovery mode software ReiBoot. The tool is used to solve all the stuck issues related to iPhone, iPad, and almost all Apple devices. It offers one-click solution to enter as well as exit the recovery mode if you are stuck in it. In addition to this, users have to pay no cost to enter as well as exit the recovery mode. All you need to do is follow the given below steps. Step 1: Run the software and connect your iPhone to the computer. Step 2: The software will detect your device in recovery mode automatically. 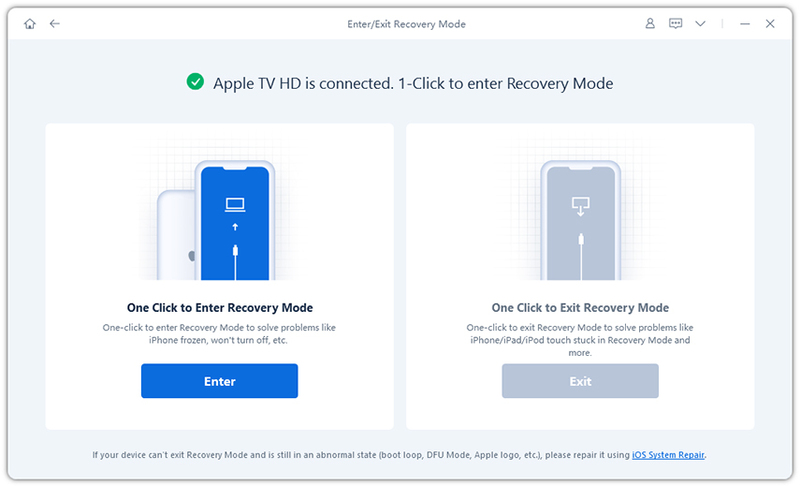 Click "Exit Recovery Mode" option. Your device will reboot normally and will open in seconds. But most of the times, this process can also fail if there is a glitch in the operating system. Hence, in such times, you need to repair the operating system. But how can you repair the iOS? Well, the answer to this, too, is Tenorshare. All you need to do is use the "Repair Operating System" function of the tool. It helps to fix many iOS glitches, such as recovery mode loop, Apple logo loop, black screen, iPhone reboot loop and other 50+ issues. Here are the steps that you need to follow in order to repair the iOS. click on "Repair Operating system" option. Next, click "Start Repair" option. Then you can download the firmware package. Once the firmware is downloaded successfully, select "Repair Now" to start the recovery of your device. After the procedure ends, your device will reboot and the issue will be resolved. There is one more method to know how to fix iPhone stuck in recovery mode loop. But this method will lead to data loss. If you are ready to take the risk, you can proceed. This method contains restoring the iPhone with the help of iTunes. This will solve the issue. However, it will also lead to data loss. Here are the steps to follow. Step 1: Connect your iPhone to the computer and run the latest version of iTunes. Step 2: Choose your device when it appears in iTunes. Click on "Restore iPhone" option. In a nut shell, you can use the above mentioned solutions if your iPhone stuck in recovery mode loop after update. It is recommended to use Tenorshare ReiBoot if you need to avoid the data loss.